As you may know, here on The Bubbly Professor, one of my favorite subjects is the sublime pairing of food and wine. For those people who say, “Just drink what you like!’ – or – “Don’t overthink it!” All I can say is, I stand accused! I’m an overthinking, techno-babbling, paralysis by analysis food and wine geek. Girl can’t help it. I also can’t help the fact that – despite my obvious interest in, and bias towards wine, there exist on this earth people who prefer beer to wine. As of late, some have even snuck their way into my social circle. So, in the interest of being an all-inclusive, the-more-the-merrier, gather-round-the-table kind of friend, I’ve figured out a few things that make beer taste even better with food. 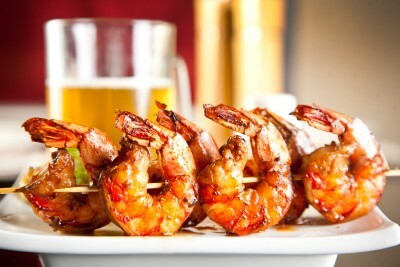 In general, the same rules apply for pairing beer and food as apply to wine and food. Keep the basic principles concerning taste, flavor, and texture front-and-center in your mind. Many beers are downright sweet, and pair nicely with desserts. Other good choices for the sweet course include higher-alcohol beers and very dark beers. Most beer is very acidic, which can be a good match for acidic foods and salty foods. Hops can help beer to “cut through” rich foods, making a hoppy beer a good match for rich, meaty foods, much like tannic wine and rich food. As with wine, keep in mind the texture, or weight of your beer. Beer can be classified as light-medium-full bodied in much the same way as wine. 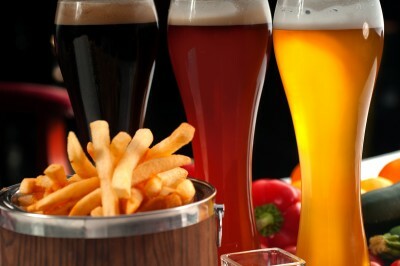 Lighter-bodied styles of beer include German Beers, Wheat Beers, Steam Beers, Light Beers, and Pale Lagers. Medium-bodied beers include Amber Ales, Pale Ales, Vienna Lager, Cream Ales, and some dark Ales. Full-bodied beers include Bocks, Imperial Stouts, Strong Ales, Barleywine, and Trappist Ale. Beer’s amazing diversity and complexity of flavors allow it to pair well with a wide range of dishes, including the fiery-hot and super-spicy…these foods are sometimes tough on wine. There are far more styles of beer available than wine. No matter what the food, chances are you can find a beer that goes great with it. Beer has bubbles, and if you have bubbles, you’ll have no troubles. On average, beer has half the alcohol content of wine, so you don’t have to worry about the alcohol clashing with food. Beer, due to its always-cold, always bubbly, low-alcohol, and sometime spicy characteristics, will always be a good choice for hot, spicy ethnic foods, such as Indian, Asian, and Mexican dishes. Nothing says “tail-gate” or “beach party” better than beer. Beer tends to be more of a socio-economic leveler. Translation: it’s cheaper than wine.